The “Teacup Chat” series on Lavender & Twill is a short and sweet spot where we take a glimpse behind the scenes of a brand’s creative process. I am very inspired by all the creative talents I see finding a way to showcase their work. I think it’s fantastic to be able to pursue something you love, and have others love it too. 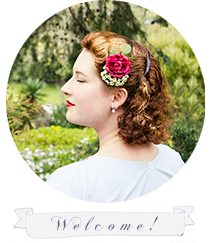 As we found out in the last post on Lavender & Twill, Chatterblossom is a lovely Etsy shop where Jamie hand crafts and sells stunning, one-of-a-kind floral hair pieces and fascinators using mainly reclaimed vintage millinery supply and trimmings. So without further ado, let’s get to know some more about the artist we have featured here today! Hello Jamie, and welcome to our teacup chat! Thank you for spending sometime with us today so we can get to know little more about you and your business. What first drew you into creating your hair flowers and fascinators? About 5 years ago, I worked on a small organic farm where we grew vegetables and flowers and I fell in love with all things floral. I made the bouquets for our farmer’s market each week and loved seeing peoples’ faces when they decided to purchase a bouquet I’d made to decorate their home. Cut flowers are amazing, but also a luxury for most people. And we really relish in it when we can have something so fleetingly beautiful around us for even a few days. When I moved to another home in another state, I missed working with flowers and I wanted a way to work with them again. My love of vintage and flowers intersected when I moved to Raleigh, North Carolina. I found a swing dancing community here and many of them wear vintage or vintage inspired clothing and flowers in their hair, so I started making some hair clips to suit their/my needs. Then I got a tip from a random stranger about a warehouse full of deadstock vintage flowers right in the heart of Raleigh! So I purchased as much as I could and my venture began in earnest! Is it tricky to restore the vintage millinery flowers? Have you ever had any past the point of no return? What happened to/with them? Most of the millinery flowers I find or purchase are new old stock or deadstock, which means they’ve never been used. Almost all of my flowers were found in their original boxes with tags, so they just need some freshening up (with steam and shaping, etc.). I do sometimes purchase or find millinery flowers in worse condition, but I typically try to get pristine examples if possible. The flowers that have seen better days I’ll usually use in conjunction with flowers in better condition as a cluster, so they get a second life but aren’t necessarily the star of the show. Or I’ll keep them for myself as I don’t typically mind flawed beauties. They’re just as pretty! It’s been very interesting to find out more about your business, but we’d also love to know a little more about the creative mind behind these beautiful pieces. Every vintage lady I know seems to have their own unique style ~ if you were to describe your personal vintage look, how might you do that? I think the best way to describe my personal style is “fluid” or “chameleon-esque”. I really enjoy trying to wear things that I’ve been personally told I can’t wear or that seem challenging to put together in a way that “works”. I enjoy wearing hyper-feminine to androgynous to typically masculine looks. I love both light-filled, floral frills and dark, earthy subtleties and mixing them is even more fun. I don’t worry about “period appropriateness” or wearing only one era as a rule, etc. I love mixing and matching to produce something all my own. What is the one vintage thing you can’t live without (red lipstick, novelty prints, hats, etc)? This is a very tough question! Because I change my look so often, I want to say…my vintage 1950s butterfly bullet bra. Ha! It is a softer pointed shape and I have never found a more perfect bra. It suits nearly every outfit I wear it with and it makes me stand different in my clothes. So I guess it is an unseen thing I can’t live without. I’m going to be one sad cookie when that bra dies. And finally, what are three quirky things about you that not everyone might know about? - My first job was as a roller-skating drive-in restaurant waitress and they only played music from the 1950s, so maybe the vintage vibe snuck in early. - I’m extremely introverted but most people would never guess it because I’m a bit “chameleon-esque” in my personality as well and can morph to suit my situation when necessary. - When I’m not in vintage attire, I’m typically in hole-y sweatpants and raggedy t-shirts. Thank you to Jamie for sharing her time with us, it was wonderful to have the chance to learn more about her and her inspiring creative work! And if you haven’t already, don’t forget to check out Jamie on Instagram and Etsy.